LX122 and LX122 Premium are Mac OS X 10.4 (32-bit PowerPC and Intel) and OS X 10.6 (32- and 64-bit Intel) or later- compatible (VST, AU, RTAS — Pro Tools 7.0 or later) and Windows XP, Vista, and Windows 7-compatible (VST, RTAS Pro Tools 7.0 or later) rotary speaker emulation plug-ins, both featuring XILS-lab’s proprietary True Stereo Dynamic Engine (TSDE), offering a whole new way to record rotary speaker effects. As such, LX122 and LX122 Premium are the perfect partner for present-day organists and keyboardists everywhere — or, indeed, anyone seeking that still-sought-after sound, so first… a little history: the instantly recognisable tone of a Hammond organ/Leslie speaker combo remains a staple of many musical genres — think Procol Harum’s psychedelic multi-million-selling single ‘A Whiter Shade Of Pale’, one of the standout anthems of 1967’s so-called Summer Of Love. Yet there was little love lost back in 1937 when Leslie speaker inventor Donald Leslie bought a Hammond, hoping it would prove to be a suitable substitute for a pipe organ. Disappointed with its sound at his home compared to the spacious showroom where he had originally heard it in action, Leslie sought to improve things somewhat by experimenting with his own moving speaker designs, finally settling on the now-familiar form of a rotating drum and horn for bass and treble frequencies, respectively. Until now, a classic rotary speaker system simply comprised a stationary treble unit with spinning horns and a stationary woofer with spinning rotor (or drum), together with two filters to divide the frequency spectrum between the horn and woofer; both the horns and the sound baffle for the bass are rotated to create Doppler effect-based vibrato, tremolo, and chorus effects, while the rotating elements can be stopped, switched between slow (chorale) and fast (tremolo), or transitioned between the two settings. All are effortlessly emulated in LX122’s core modules alongside an authentic recreation of tube-based amplification — one of the most important characteristics of the original concept, which inadvertently paved the way for the heavier rock tones pioneered by the likes of Deep Purple’s Jon Lord, together with three reverb types, and MIDI-controllable SLOW and FAST mode buttons (for individually controlling the horn, drum, or both by keyboard inertia) for added flexibility. Remaining in the computer-centric 21st Century, XILS-lab recognise that the true sound of a rotating speaker rests principally in how it reacts to the room in which it resides; to that end, the TSDE algorithm adeptly evokes this physical phenomenon. Moreover, the angle of the two ‘recording’ microphones can be tweaked within LX122 and LX122 Premium to allow varying amounts of room effects into the resultant mix, while internal cabinet reflections are also emulated to faithfully capture that much-loved mellowing side effect. It is even possible to increase or decrease speaker positioning from far away to directly within the cabinet itself — impossible with real rotary speakers, of course! As implied by name, LX122 Premium is fundamentally the same as its LX122 software sibling, yet offers much more sonic scope to the discerning user, including control over microphone movement, room choice, room size, cabinet speed, horn diameter, diffuser removal, speaker configuration, ribbon age, horn and drum balance, rotation direction, and more besides. 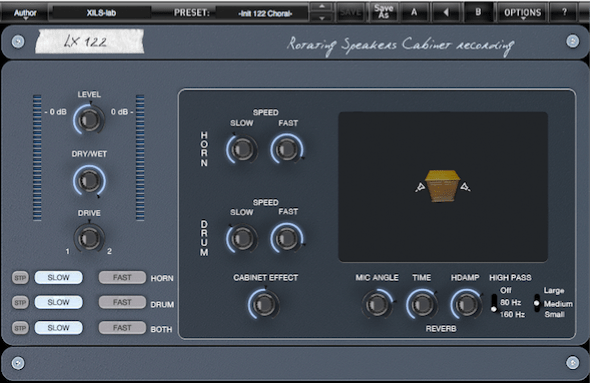 Digging deeper, its additional Studio Panel allows users to position the microphones anywhere within five different room models, for example, while different cabinet configurations can be chosen within the Cabinet Panel, as well as randomly rotating the horn and drum. Don’t be afraid to experiment; LX122 Premium is even better than the real thing, capable of rotary speaker effects hitherto unheard of in the real world! LX122 features 14 factory presets to get users started, while LX122 Premium boosts that magic number to 75 by way of ably demonstrating its increased sonic scope. So why wait to rotate? LX122 and LX122 Premium are available to purchase from the dedicated XILS-lab online Store (http://www.xils-lab.com/products/LX122.html) for a special introductory price of €29 EURO/ $37.00 USD (LX122) and €45 EURO/$58.00 USD (LX122 Premium) until December 5 (respectively rising to €39 EURO/$49.00 USD and €69 EURO/$89.00 USD thereafter). Note: these are serial number-protected products — no iLok required!